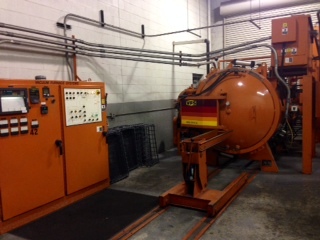 Vacuum Department | Temp-Rite Steel Treating, Inc.
Before processing, work is inspected and cleaned to remove any oils or contaminants, in order to prevent discoloration and surface flaws before the heat treating process begins. Parts are then loaded and sealed into a vacuum chamber. Once all air is removed, parts are heated to the desired temperature and soaked at heat for the required amount of time. This ensures uniform heating and helps to reduce any variance within the load. Once ready to quench, the chamber floods with nitrogen while a blower circulates the air to increase uniformity.